It’s time to start thinking about Superbowl not to mention cold winter nights. The food that always comes to mind is chili. I have already posted my white bean chili, which I love but this is a more common version. Chili is not an exact science and you can feel free to make substitutions where you like. Obviously the toppings are optional and at your own discretion. Chili is just so easy to make. It sits on the stove or your slow cooker and when you’re ready to eat it, it’s all done. I like chips or taco shells with this. I love fresh jalapeno on the side chopped up, guacamole, refried beans, etc. If you don’t want beef, make it with turkey instead. I usually make it with turkey but this time out I made it with ground beef because I couldn’t get the turkey. We just landed in Aspen and the small market by the airport only had ground beef so it will have to do. I usually make this one day ahead for a special event. This allows the flavors to all meld together and then I just reheat–couldn’t be easier. 2 lbs. ground beef or ground turkey–If I am using ground turkey I prefer ground dark meat if you can find it. It’s much more flavorful . You can use white meat turkey but try for 85/15. That’s 85% white meat with 15% fat. I just find the O% fat to be very dry. Of course these are all personal choices. Place the ground beef or turkey in a large stock pot (Le Creuset) and put in the garlic. Cook over medium heat until meat is browned. Drain off any excess fat. Add in the tomato sauce, chili powder, cumin, oregano, salt and cayenne. Stir together well, and reduce heat to low. I use the 15 oz. can of tomato sauce as a measuring cup and add 1 -2 cups of water (this time out I used 1 1/2 cans of water.) Let simmer for an hour or so, covered, occasionally stirring, and adding water, if necessary. Place the masa harina in a small bowl. Add 1/2 cup water and stir together with a fork. Add masa mixture to the chili and stir together and taste for seasonings. Add more water if needed. Add the beans, corn, and chilis. I usually add salt at this point. Simmer for another 1/2 hour or so covered. It can simmer for a long while, if you so desire. Or, turn off heat, and just heat up 1/2 hour before serving. You should check for thickness. During the last 1/2 hour, I added a bit more water . Serve with assorted toppings I’ve listed. Cheese, jalapenos, chips, guacamole, salsa, chopped red onions, sour cream and cilantro. 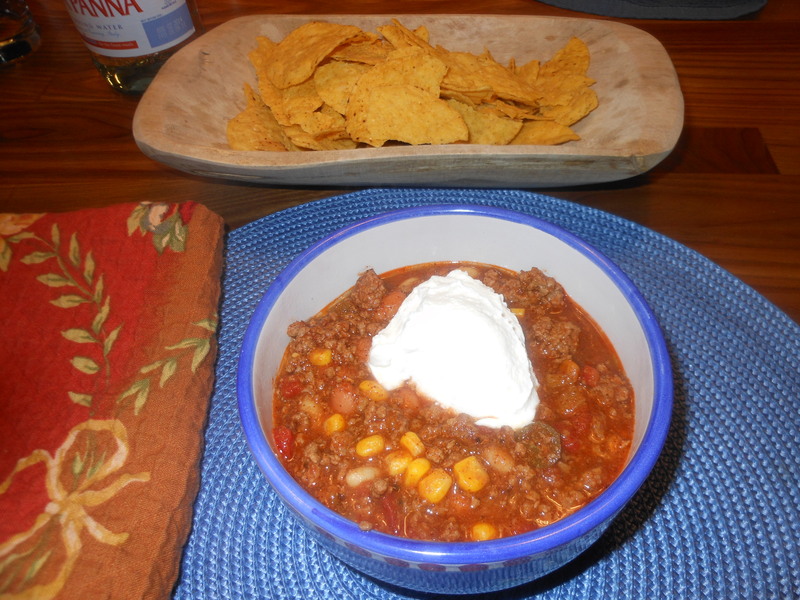 We love small soft tortillas on the side of our chili! makes Superbowl time and the food that always comes to mind is chili. I have already posted my white bean chili, which I love but this is a more common version. Chili is not an exact science and you can feel free to make substitutions where you like. Obviously the toppings are optional and at your own discretion. Chili is just so easy to make. It sits on the stove or your slow cooker and when you’re ready to eat it, it’s all done. I like chips or taco shells with this. I love fresh jalapeno on the side chopped up, guacamole, refried beans, sour cream, cheese, salsa, diced red onions, etc. If you don’t want beef, make it with turkey instead. I usually make it with turkey but this time out I made it with ground beef because I couldn’t get the turkey. We just landed in Aspen and the small market by the airport only had ground beef so it will have to do. I usually make this one day ahead for a special event. This allows the flavors to all meld together and then I just reheat–couldn’t be easier. By the way this is so delicious you should make it all year round. I usually make it a few days ahead and keep in the refrigerator. And if it’s for two of you then you will have some amazing left-overs. This freezes amazingly well. (I have kept frozen for up to 2 months) perfect for when you remember you have this in the freezer and have no other dinner planned! 2 lbs. 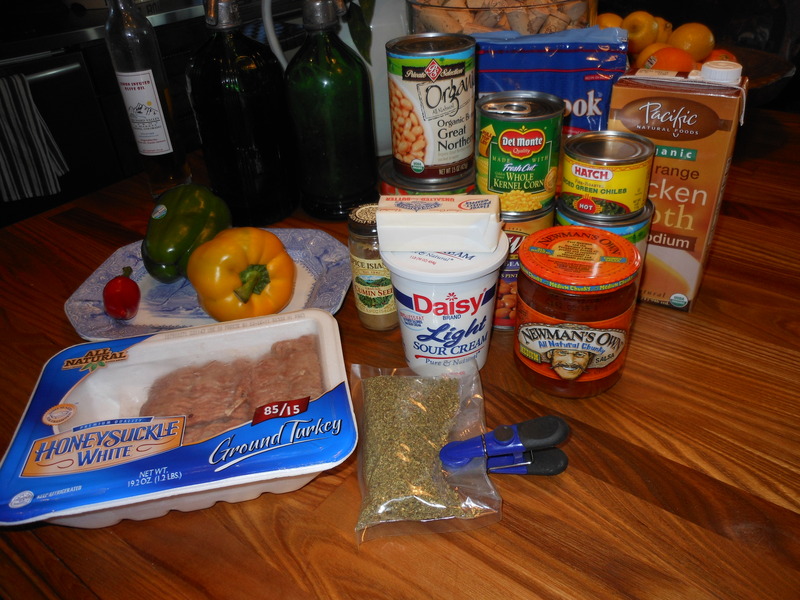 ground beef or ground turkey–I prefer dark meat ground turkey, it’s just much more flavorful. If you prefer white try and get 85/15 white meat. 100% white meat turkey can be very dry. It’s a preference and you can use whichever you prefer–just saying…. 1 can (12 – 14 oz) tomato sauce, and then about 1 – 2 cans of water–you may need to add more water if chili gets too thick. Serve with assorted toppings I’ve listed. Cheese, jalapenos, chips, guacamole, salsa, chopped onions, sour cream and cilantro. Superbowl and Winter time and the food that always comes to mind is chili. 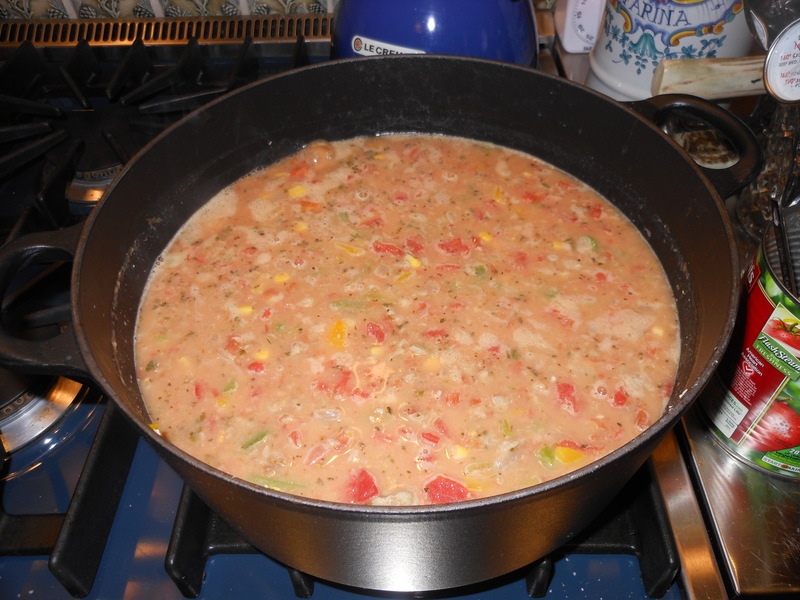 I have already posted my white bean chili, which I love but this is a more common version. Chili is not an exact science and you can feel free to make substitutions where you like. Obviously the toppings are optional and at your own discretion. Chili is just so easy to make. It sits on the stove or your slow cooker and when you’re ready to eat it, it’s all done. I like chips or taco shells with this. I love fresh jalapeno on the side chopped up, guacamole, refried beans, salsa, shredded cheese, etc. If you don’t want beef, make it with turkey instead. I usually make it with turkey but this time out I made it with ground beef because I couldn’t get the turkey. I prefer dark meat turkey or chicken, you can do 1/2 and 1/2. I usually make this one day ahead for a special event. This allows the flavors to all meld together and then I just reheat–couldn’t be easier. This was originally posted back in winter of 2013. 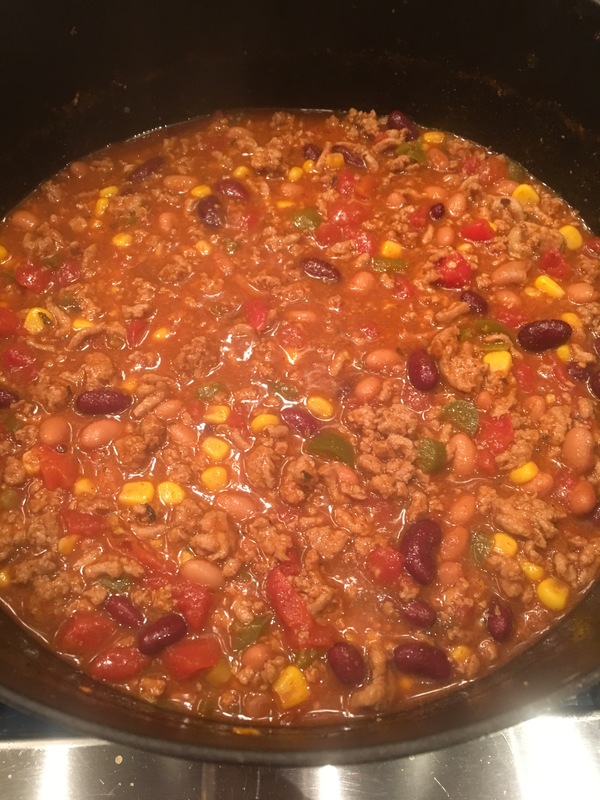 I am re-posting it for those of you looking for an awesome chili for Superbowl Sunday . Enjoy! 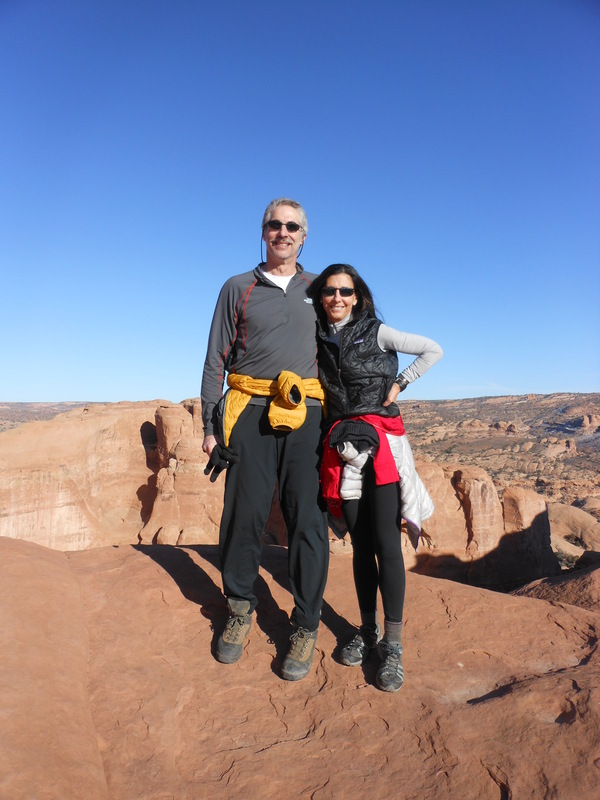 We just got back from two beautiful days in Moab, Utah. 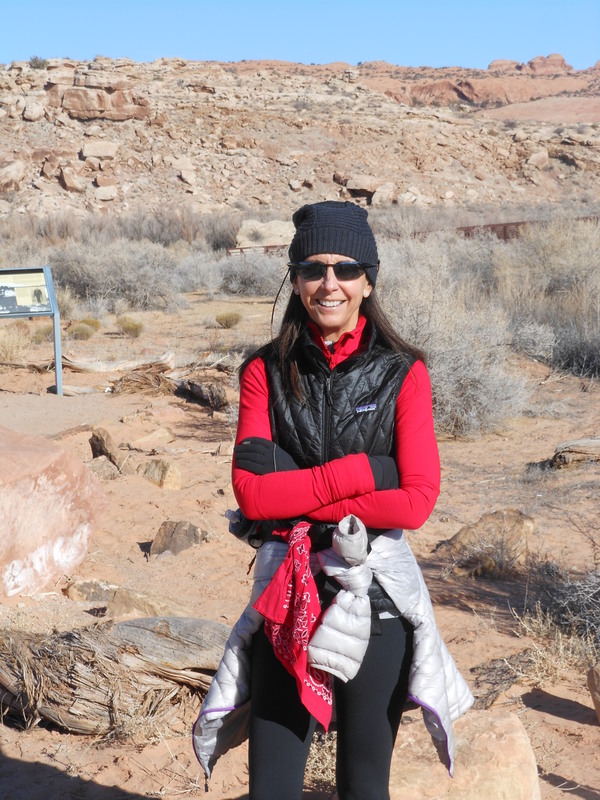 We hiked most of the time and the glory and splendor that is there has no words. If you ever have the opportunity to go you should do so. 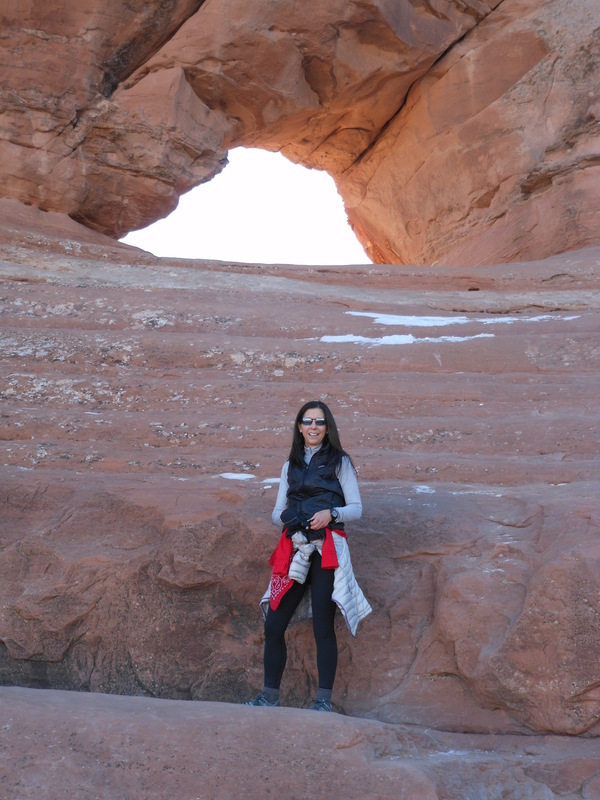 It is an amazing area–Arches National Park, the Canyonlands, the whole area is just breathtaking. We hadn’t had snow here so we went on the road. Now we’re back and today was spectacular! It snowed in Aspen last night and we skied today. So nice to be back skiing. It was Sunday, and the Giants were in the playoffs. Joel set the DVR and we were gone all day. 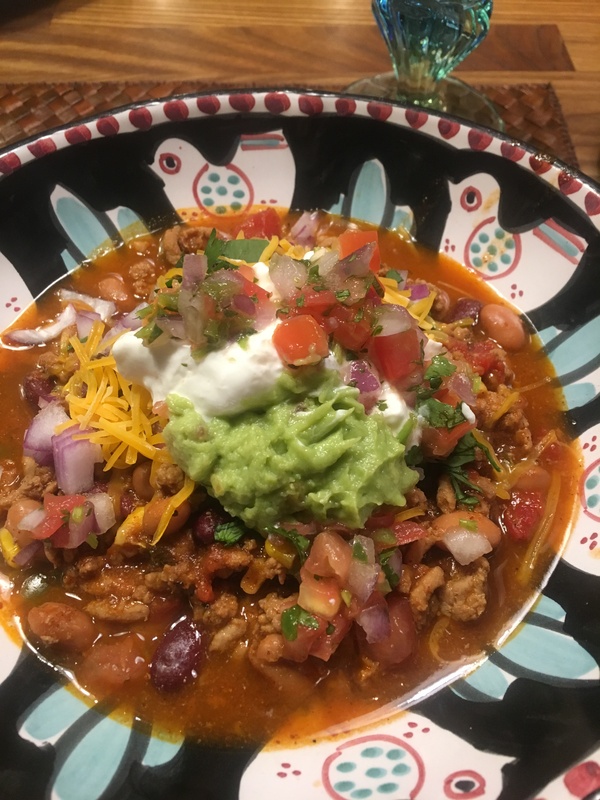 I had taken out a package of chopped turkey and figured that I would pick up a few things and make this chili that I love. I use a lot of stuff from my pantry and substitute ingredients where necessary (it’s a think-on-your-feet kind of recipe!) I served with shredded cheese and chips, and it was heartwarming and delicious. I also have to add a little note: I cook a lot and usually make a big mess. Joel always cleans up and he is such a good cleaner upper! Our deal is that I do the cooking and he does the cleaning. I might add that this is a very good deal because I am not so fond of cleaning up the mess I make cooking. Obviously, I try to clean as I go, so as to not be a complete pig about it, but he’s really a good sport about it, in general. 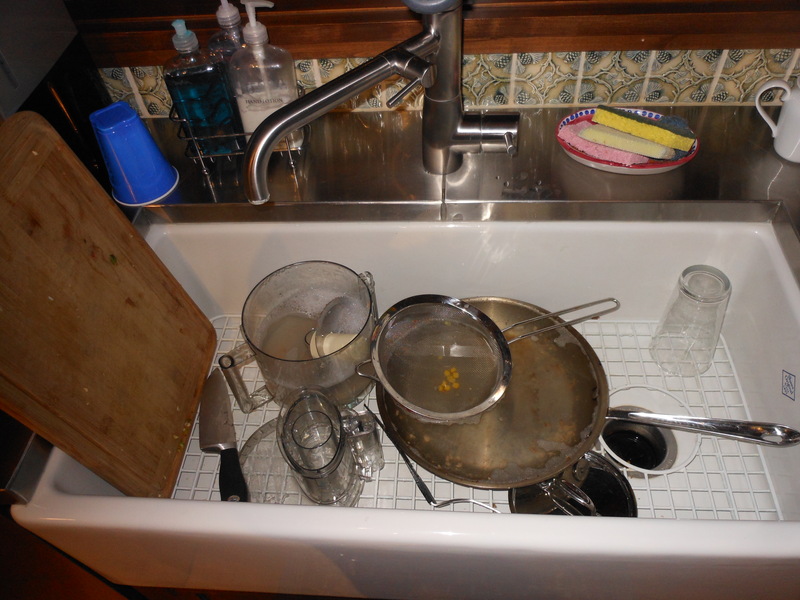 Anyway, he asked me to post a picture of some of the mess I left him in the sink. I also make this as one of my dishes for Super Bowl but usually for Super Bowl I do it in the slow cooker so it stays warm for a long time. I just throw all the ingredients in the slow cooker and simmer away. Tonite I cooked it in my trusty Le Creuset. I often mess around with these ingredients and you can too. For instance, I only had 1 can of White Northern Beans but I had 2 of Pinto so as long as they are white beans it’s okay to use them. I didn’t have Picante sauce in the house, but I had some great salsa, so I used that instead. I made it with turkey but you can use chicken, or eliminate meat altogether and make it vegetarian with vegetable broth instead of chicken broth. It’s chili, which is not a perfect science by any means; so be flexible with ingredients, but make sure to use proportionate amounts. 3 – 4 cups chicken (or vegetable) stock (I start out with 3 and if it is too thick I usually add up to another cup.) I did use 4 at the end, if you’re eating it that night use 3 then before you freeze or refrigerate add another cup to the pot so as to add some more liquid. 12 oz. sour cream (Lite is good. Non-fat is okay, but I don’t love it. Strain first to get rid of that little bit of liquid. You can also use yogurt. Add this ingredient last and blend in well.) Sometimes, I take it out of container and mix it up a bit so it will blend in better. In a large stockpot (my trusty Le Creuset) melt the butter on a medium heat. Add onion, peppers and garlic and cook until soft. I add the garlic at this point and a little kosher salt. Puree 1 1/2 cans of the drained beans (Cuisinart food processor is best) until beans are smooth and add to the pot. Add the rest of the beans, along with the salsa, chiles, corn, tomatoes, and spices (plus anything else you may want to add). Cook for a few more minutes on a low heat, until the ingredients are blended. Before you’re ready to serve it, add the sour cream and blend well while simmering. I place the shredded cheese, extra sour cream, chips, fresh-cut up jalapenos, salsa (and sometimes guacamole) in bowls on the side so everyone can make their chili their way. This is so easy, you can make in the morning, and let it sit all day in fridge. You may want to add liquid at some point when you serve. We ate it that night, and then I put in containers for fridge and freezer. I added the rest of the stock before I froze it. Just add back to pot and stir, and then ladle into containers. Keeps in fridge for at least 3 days. Perfect for freezing, I just take it out of freezer in the morning and by evening it should be defrosted , heat it up and you may need to add some liquid if it is too thick. Those little boxes ( 1 cup size) of broth come in handy here. Superbowl time and the food that always comes to mind is chili. I have already posted my white bean chili, which I love but this is a more common version. Chili is not an exact science and you can feel free to make substitutions where you like. Obviously the toppings are optional and at your own discretion. Chili is just so easy to make. It sits on the stove or your slow cooker and when you’re ready to eat it, it’s all done. I like chips or taco shells with this. I love fresh jalapeno on the side chopped up, guacamole, refried beans, etc. If you don’t want beef, make it with turkey instead. I usually make it with turkey but this time out I made it with ground beef because I couldn’t get the turkey. We just landed in Aspen and the small market by the airport only had ground beef so it will have to do. I usually make this one day ahead for a special event. This allows the flavors to all meld together and then I just reheat–couldn’t be easier. Serve with assorted toppings I’ve listed. Cheese, jalapenos, chips, guacamole, salsa, chopped red onions, sour cream and cilantro.